View cart “Hygain Showtorque” has been added to your cart. He is your BFF, you love him heaps and want him to be happy and healthy, but he is not as flexible as he used to be, he drops weight easily, especially in the cold winter months and his teeth have seen better days. Your horse is aging, a natural process, just like in humans. We assist you in providing TRU CARE for your older horse. Cereals, Vegetable Protein Meals, Legumes, Legume Hulls, Beet Pulp, Rice Bran Oil, Di Calcium Phosphate, Calcium Carbonate, Potassium Chloride, Salt, Lysine, Magnesium Oxide, Prebiotic (MOS), Natural Vitamin E, Vitamin C, Bio-Available Selenium, Yucca Schidigera, Glycosaminoglycans, HYGAIN® Vitamin and Chelated Mineral Premix. Natural Vitamin E – This unique and highly stable form of Natural Vitamin E known as RRR-a-tocopherol is up to 5 times more bio available and potent than regular synthetic sources of Vitamin E. Research has shown that this form of Natural Vitamin E provides higher retention levels in plasma, further aiding antioxidant, immune, cardiovascular, circulatory, neuromuscular and reproductive functions. 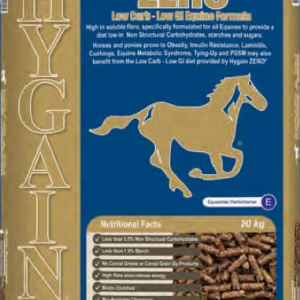 HYGAIN® RBO® Equine Performance Oil®– HYGAIN® RBO® Equine Performance Oil® is a blend of rice bran oil, omega 3, 6 & 9 essential fatty acids and natural anti-oxidants known to improve the health and structural integrity of cell membranes. Glycosaminoglycans – For the maintenance of healthy joints and mobility. Prebiotic – Prebiotics incorporated in HYGAIN® TRU CARE® have a defined mode of action, promoting a healthy gut and supporting natural defences essential for optimum health and performance. Super Fibres – As the name suggests super fibres, such as Beet Pulp, Soy Hulls and Legume Hulls are products that contain highly digestible (soluble) fibre with very little non-digestible fibre. Beet pulp is fermented in the large intestine of the horse similar to hay, pasture and chaff and does not produce rapid changes in blood sugar (Fizz) like grain. Beet pulp provides digestible energy ranging between that of good quality hay and grains, sourcing energy from soluble fibre as opposed to energy from starches and sugars. 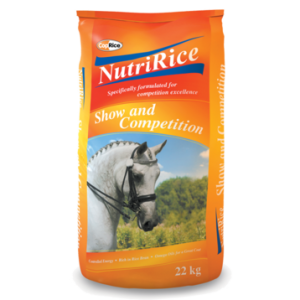 Consequently, it is ideal for all equines, especially for horses where weight gain is desired as it increases the caloric content and energy density in the diet. 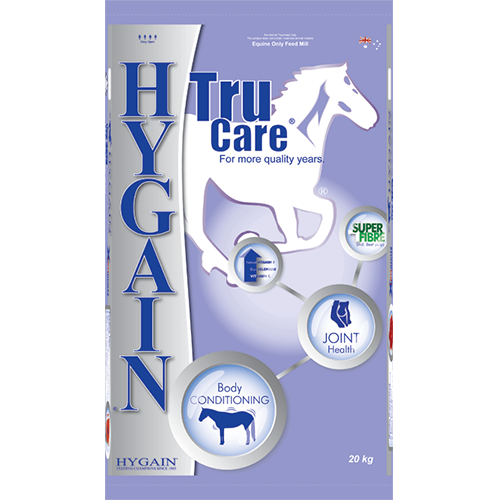 HYGAIN TRU CARE® provides a balanced diet of highly digestible fibre, fat and carbohydrates along with essential vitamins and minerals specifically developed to meet the nutritional requirements of mature horse/pony (6 yo +) when in work, at rest or enjoying retirement. HYGAIN®’s controlled moisture and pressure cooking process (extrusion) promotes highly efficient digestion and nutrient utilisation and improved feed safety. 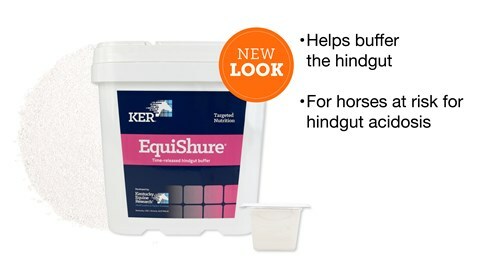 The extruded cube can be soaked in water, resulting in a mash that is ideal for horses with poor dentition. Care should be taken to match feed intake to age, breed, appetite, exercise, desired body condition, pasture/hay quality and availability and climate. HYGAIN TRU CARE® should be fed in conjunction with quality pasture, hay, chaff or soluble fibre sources. 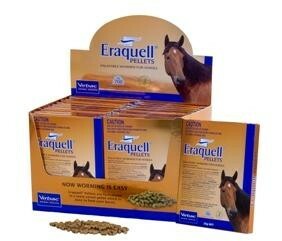 Introduce HYGAIN® TRU CARE® to your horse’s diet gradually over a 7-14 day period.